$1,599.99 Seen a lower price? 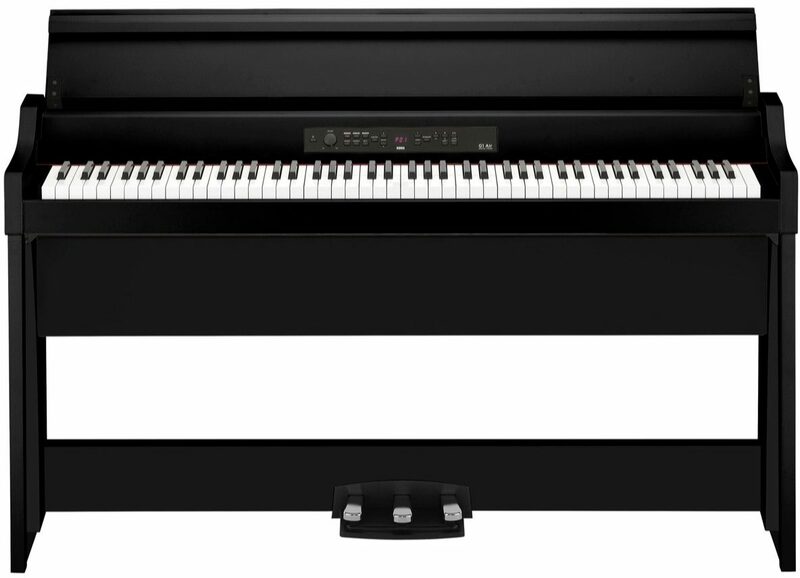 The breathtakingly detailed sound and dynamic feel of the Korg G1 Air Digital Piano provides the pianist with every possible shade of musical expression. Based on decades of ground breaking piano sound technology from Korg, makers of the award-winning KRONOS, and a precisely engineered keyboard that responds perfectly from gentle pianissimo to powerful fortissimo, KORG have created a unique digital piano. The technology of the G1 is so advanced you can even see it; the beautifully crafted slim-line cabinet of the G1 is a result of Korg's unique history of musical instrument design and audio technology. Finally, there is no compromise between superb sound and impeccable design. Creating an immersive sound experience from a digital piano as compact and stylish as the G1 is a truly remarkable achievement. When you see it, touch it, and hear it, the Korg G1 will change your perception of digital pianos forever. In order to achieve a sound that is as close as possible to that of an acoustic instrument, the three main pianos in the G1 analyze performances dynamics to seamlessly select between different sets of piano samples. From a delicate pianissimo to a powerful fortissimo, the player's expression is realistically reflected in the sound. Key-off simulation recreates the sounds that are produced when the player's fingers lift off the keys. Connect a Bluetooth device such as a smartphone to the G1 Air and enjoy playing the piano along with your stored music or other audio. When you're not playing the piano, you can use the G1 Air as a powerful Bluetooth speaker system. 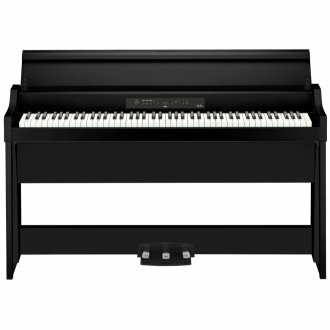 The G1 features the real weighted hammer action 3 (RH3) keyboard which accurately simulates the playing experience of a grand piano, with a heavier playing feel in the lower register that becomes lighter as you move up the keyboard. It is extremely responsive, even when notes are repeated quickly, while the performer's expressive dynamics are faithfully interpreted even in the most complex passages. Key touch control is also provided, with a choice of five levels of sensitivity (light, normal, heavy, stable, fixed) to specify how your playing dynamics are reflected by the sound produced. A custom-designed speaker system recreates the incredibly realistic sound field of the G1 acoustic pianos and other instrument voices. With two large-diameter speakers placed below the keyboard in a resonant enclosure, the full dynamic range of sound is conveyed directly to the player, while high-frequency tones are presented by a pair of speakers mounted above the keyboard. In conjunction with resonances from the cabinet, these provide a rich piano tone, reflecting off the key cover and delivering indirect acoustics similar to those of a traditional instrument. The amplifier section provides 20W of output power for each of the four speakers, delivering up to 80W of sound of the highest quality. From rich bass to brilliant highs, you will experience the nuanced, expressive power of the grand piano in your own home. Simply by pressing one button, you can apply a bass sound to the lower register of the keyboard. Play piano with your right hand and bass with your left to instantly enjoy jazz performance styles. By pressing two of the tone buttons simultaneously, you can easily layer two sounds together. For example, layer piano and strings to play with a rich piano and orchestra combination. There's also a partner mode that enables you to divide the piano keyboard into two identical sections on left and right, each with their own damper pedal. This is a great way for teacher and pupil to play duets or copy and practise during lessons. Available until 11 PM (EST) today. Mention special code 20F-VW50 when you call.